Brian is a man of the people. Note: The eating for this post was actually done the day before the Orochon Ramen challenge. But since my pain and misery is more entertaining in general, this got pushed back by a day. Taco trucks are an L.A. tradition. Kinda like hot dog carts in New York. I’m not talking about your average “roach coach” greasy, almost inedible food. I’m describing a traditional mexican restaurant on wheels. Most of your good taco trucks don’t even move very often. This particular one, that I will be reviewing in a moment, has two locations that it splits the day between. My buddy Adam is the one who tipped me off about Mariscos del Mar. He was doing research for a school project on taco trucks and came across this one. 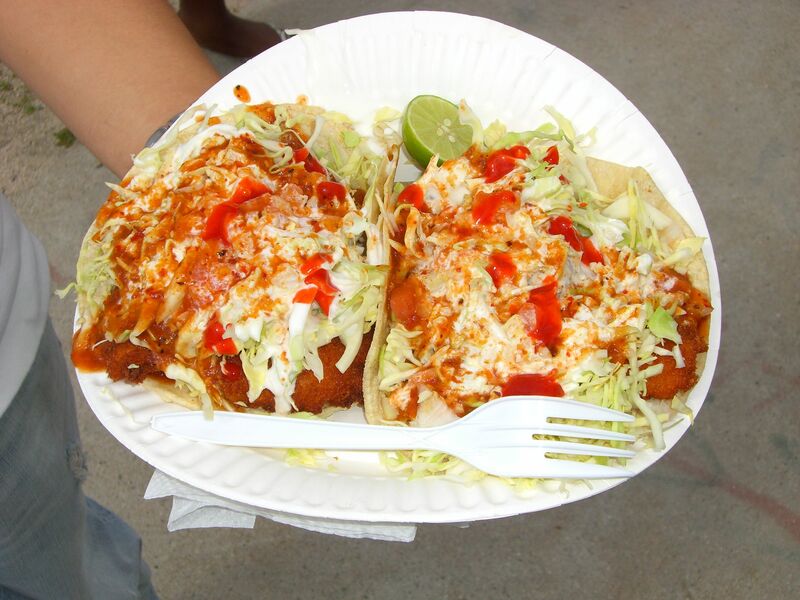 If you know spanish, then you can probably figure out that this taco truck specializes in seafood tacos. If you don’t know spanish, then just read the last sentence. And then look at the pretty pictures. First of all, I should tell you that I don’t normally eat fish tacos, so I don’t have a huge database to compare these tacos to. However, I have eaten a ton of tacos in my life, and quite a bit of fried fish. So by combining these elements, I think I can provide you with a decent idea of how good these tacos are. Before I start talking about the food though, I would like to address the ambiance for a moment. Mariscos is parked next to a scenic open field. I could have spent all day under those high voltage lines, but since we were pressed for time, we decided to eat next to the truck with about a half dozen other people. Adam and I both ordered two tacos, one fish taco and one shrimp. The total cost for the two tacos was $4.50 which is a good value for seafood tacos anywhere. What really impressed me was the sheer size of the tacos. They engulfed the plate, leaving room for nothing else. I know it looks like there is a lot of cabbage and sauce, which there is. But I was more than satisfied with the amount of fish as well. I think my shrimp taco ($2.50) had about five or six fried shrimp that were pretty big. The breading tasted really crisp even with the sauce soaking in, and yet the fish was not dry at all. Did I mention that we got these for less than five bucks? It was awesome. The sauce that comes on the tacos is a combination of crema and salsa. It had nice flavor and surprisingly, quite a bit of heat too. Of course they have all kinds of hot sauce if you need even more of a kick. After we finished our tacos, we realized that Mariscos had Coke in a bottle. Never the one to pass up on something old-school, I bought one for each of us. I gotta say, Coke really does taste better out of the bottle. Or it least it feels better to have that bottle in your hand on a hot afternoon. To review, if you haven’t been to a taco truck, you best be gettin’ on that. If you like fish tacos than Mariscos is definitely worth the trip, and for those of you on a tight budget (myself included) this is quite possibly the best value I’ve written about so far. If you have any other spots that match up in the value department, let us know in the comments. P.S. – If you drive by and it looks like this, they’re probably down the street at victory. I have got to stop reading this at night. At least I’m not pregnant, I’d be driving around LA right now looking for this truck. Awesome. I’ll be in the area tomorrow. Hopefully I’ll have time to look this truck up. Oh yeah. Keep up the Mexican food reviews. You are pleasing me to no end.